I am a bit worried what impact of the trip to Assab will have on my health. Stories of high temperatures in the Denkalia Desert should be a warning to start with a optimal condition. Today I will take some rest, eat well and do some shopping (mineral water!). Before I left to Eritrea I bought myself a tube of multi vitamins, but the body requires more then that to prevent fainting. Fish and Terhas have a chicken farm, so I start the day with an omelet. 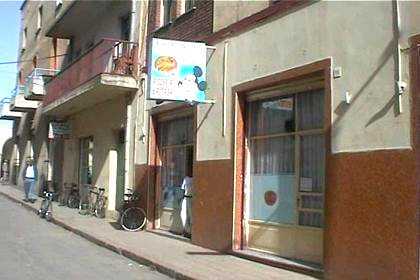 In the shop window of Photo Sahel I saw some beautiful pictures of the Eritrea Airlines plane. Unaware of the price of such pictures I first ask for the price of a copy in similar dimensions in an other photo shop. I do not want to pay to much extra for my enthusiasm. At Photo Sahel they charge me exactly the price mentioned. No surcharges for copy rights. I expected some bargaining, because it is impossible to make pictures at Asmara Airport, so they could easily have charged some extra Nakfa's. I spend the rest of the day buying postcards and small souvenirs, enjoying cappuccino's and strengthening my body for tomorrows trip to Assab. One of the best places to buy the souvenirs is the market that can be easily found at the back side of the main mosque, when coming from the main street (Harnet Avenue). There is a variety of traditional pottery, clothes, small handicraft, and it is cheap. In front of the American Bar I meet a Dutch couple, Olga and Michael, visiting Eritrea as well. They share their experiences with my. A man is trying to sell them old coins. In just a few minutes the price for the coins drops to two coins for ten Nakfa. The are a nice souvenir for that price. I have diner in the China Star restaurant, near the Nyala Hotel. 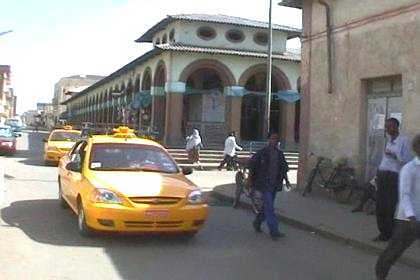 The restaurant is popular among the UN personnel in Asmara. I am one of the first guests, but soon the restaurant is crowded with visitors, speaking all kinds of different languages. In a supermarket I buy four large bottles of mineral water and some biscuits and other fast food for the 700 kilometer trip. Must be enough to survive the desert. The alarm clock is set at 3:30. 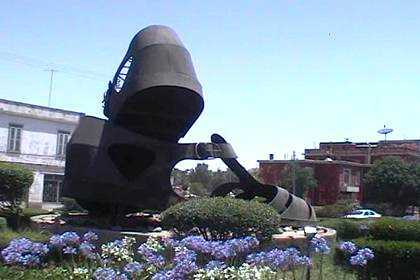 Shida monument - Asmara Eritrea. 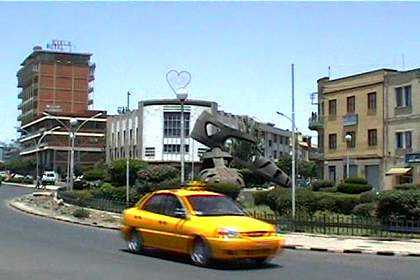 Nyala Hotel and Shida monument - Asmara Eritrea. 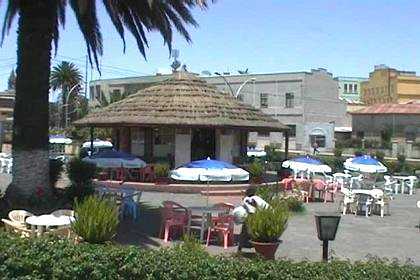 Den Den Government club - Asmara Eritrea. 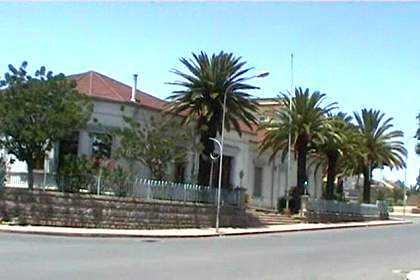 Government buildings - Asmara Eritrea. 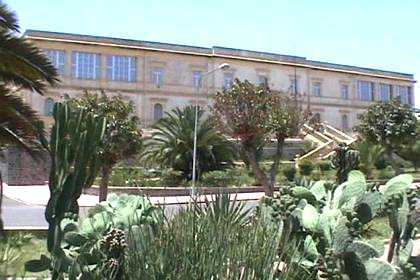 City Park - Asmara Eritrea. 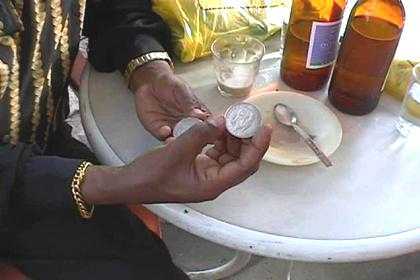 Judgement of historical coins "two for ten Nakfa"
Covered markets - Asmara Eritrea. 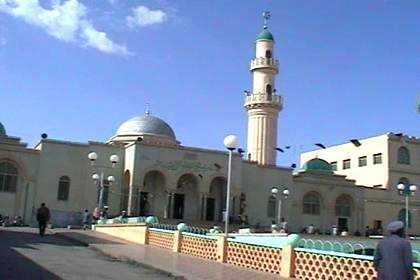 Grande mosque - Asmara Eritrea. 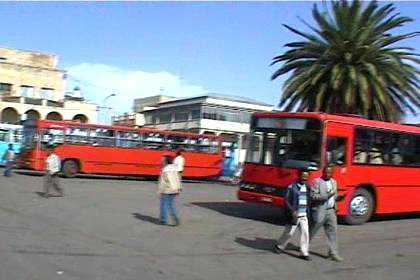 Mede Ertra bus station - Asmara.